Many prey species around the world are suffering declines due to a variety of interacting causes such as land use change, climate change, invasive species and novel disease. Recent studies on the ecological roles of top-predators have suggested that lethal top-predator control by humans (typically undertaken to protect livestock or managed game from predation) is an indirect additional cause of prey declines through trophic cascade effects. Such studies have prompted calls to prohibit lethal top-predator control with the expectation that doing so will result in widespread benefits for biodiversity at all trophic levels. However, applied experiments investigating in situ responses of prey populations to contemporary top-predator management practices are few and none have previously been conducted on the eclectic suite of native and exotic mammalian, reptilian, avian and amphibian predator and prey taxa we simultaneously assess. We conducted a series of landscape-scale, multi-year, manipulative experiments at nine sites spanning five ecosystem types across the Australian continental rangelands to investigate the responses of sympatric prey populations to contemporary poison-baiting programs intended to control top-predators (dingoes) for livestock protection. Prey populations were almost always in similar or greater abundances in baited areas. Short-term prey responses to baiting were seldom apparent. Longer-term prey population trends fluctuated independently of baiting for every prey species at all sites, and divergence or convergence of prey population trends occurred rarely. Top-predator population trends fluctuated independently of baiting in all cases, and never did diverge or converge. Mesopredator population trends likewise fluctuated independently of baiting in almost all cases, but did diverge or converge in a few instances. These results demonstrate that Australian populations of prey fauna at lower trophic levels are typically unaffected by top-predator control because top-predator populations are not substantially affected by contemporary control practices, thus averting a trophic cascade. We conclude that alteration of current top-predator management practices is probably unnecessary for enhancing fauna recovery in the Australian rangelands. More generally, our results suggest that theoretical and observational studies advancing the idea that lethal control of top-predators induces trophic cascades may not be as universal as previously supposed. Many prey species around the world are threatened or suffering declines in many parts of their ranges due to a variety of interacting biotic, abiotic and anthropogenic causes such as land use change, climatic change, invasive species and novel disease -. Unbalanced ecosystems with disproportionately high densities of some fauna (e.g. herbivores and mid-sized or mesopredators) can exacerbate the rate of species declines in some cases ,. Apex or top-predators such as lions (Panthera leo), bears (Ursus spp.) or grey wolves (Canis lupus) are expected to stabilise or recalibrate ecosystems by reducing populations of such overabundant species and allowing threatened prey at lower trophic levels to recover -. Moreover, many top-predators are themselves threatened, in decline or presently absent from large portions of their former ranges, and for this reason alone are worthy of conservation and restoration . Great interest surrounds the recovery and potential use of top-predators as `natural’ and low-cost biodiversity conservation tools ,. Consequently, predator management strategies known or perceived to have negative effects on top-predator populations are expected by some to produce outcomes ultimately detrimental to prey species and even vegetation communities at lower trophic levels ,. Humans are not detached from these processes given their (often unacknowledged) role as the ultimate `top-predator' or manipulator of species and ecosystems -. Though the important role that terrestrial top-predators can sometimes play in structuring food webs and ecosystems through their consumptive (e.g. predation) and non-consumptive (e.g. fear, competition) effects on sympatric mesopredator and herbivore species is well known -, top-predators are often lethally controlled to protect livestock, managed game and some threatened fauna from top-predator predation (e.g. -). Lethal control of top-predators is typically achieved through trapping, shooting and/or poisoning in different parts of the world. Lethal control of rare or threatened top-predators is often unacceptable in many cases (e.g. ), and knowledge of or expectations about the ecological roles of top-predators is often used to justify calls to cease lethal control of these threatened top-predators (e.g. ,). But not all top-predators are rare or in decline. In places where top-predator populations are very common, robust and resilient to control (such as Australia), their strategic lethal control (or periodic, temporary suppression) might facilitate profitable livestock or game production while retaining their important functional roles in limiting, suppressing or regulating overabundant species . Introduced to Australia about 5,000 years ago, dingoes (Canis lupus dingo and hybrids) are a relatively small (typically 12-17 kg) but now common and widespread canid top-predator, extant across ~85% of the continent ,. However, some specific dingo genotypes are in decline and worthy of conservation -. Genetic issues aside, dingoes' distribution and densities are naturally increasing (back into the few remaining areas, <15% of Australia, where they were formerly exterminated) despite often being subject to periodic lethal control programs for the protection of livestock and some threatened fauna ,,. Faunal biodiversity conservation is expected by some to be compromised by lethal dingo control through its perceived indirect positive effects on mesopredators and their cascading negative effects on prey (e.g. -). Snap-shot, observational, correlative or desktop studies have sometimes reported negative relationships between dingoes and mesopredators or positive relationships between dingoes and some threatened fauna (reviewed in ,). In contrast, long-term and/or experimental studies on the subject have consistently reported that mesopredator populations fluctuate independent of dingoes and dingo control over time (,-; see also ). Investigation of predator-prey relationships have been a pillar of ecological studies for decades , but applied-science studies investigating the indirect in situ responses of prey populations to contemporary top-predator management practices are few ,,,,. The prey response to top-predator control is one of the most important variables of interest where threatened prey persist and extant predators of concern can only be managed through lethal control . In these situations, reliably determining causal factors for changes in prey abundance can only be achieved through carefully designed manipulative experiments conducted at spatial and temporal scales relevant to management ,,. We therefore used a series of predator manipulation experiments - those with the highest level of inference logistically achievable in open rangeland areas , - to determine (1) whether or not sympatric prey abundances were different between areas that were or were not exposed to top-predator control, (2) whether or not sympatric prey activity levels decreased immediately after top-predator control, and (3) whether or not sympatric prey abundance trends were influenced by top-predator control over time. There are six primary relationships between top-predator control and prey fauna (Figure 1). The relationships (or lack thereof) between mesopredators and dingoes or dingo control (R1, R2 and R4 in Figure 1) were previously reported in Allen et al. , and the present study is best understood in conjunction with those results. As an extension to that work, the primary aim of the present study was not to investigate the relationships between dingoes and prey (R5 in Figure 1). Rather, we experimentally assessed whether or not ground-dwelling mammalian, avian, reptilian and amphibian prey populations were influenced by contemporary poison-baiting programs aimed at controlling dingoes (R6 in Figure 1). Comparisons were made between a series of paired poison-baited and unbaited areas monitored over time both before and after multiple baiting events using passive tracking indices (PTI; see Methods for details of study sites and design, prey population monitoring techniques and analytical approaches). These experiments were conducted at nine sites spanning the breadth of the beef-cattle rangelands of Australia, comprising one of the largest geographic scale predator manipulation experiments conducted on any species anywhere in the world . Schematic representation of the six primary relationships of interest (R1-R6) between top-predator control and prey species at lower trophic levels (see []). Linear mixed model analyses revealed a significant interaction between baiting history (i.e. consistent history, historically baited in both treatments before cessation of baiting in the unbaited area, or historically unbaited in both treatments before baiting commenced in the baited area) and treatment (baited or unbaited) for dingoes, but not for any other predator or prey species (Table 1). This is unsurprising given that baiting programs target dingoes, and as expected, baiting history and treatment were similarly significant as univariate factors influencing dingo PTI (Table 1). Overall mean and median macropod PTI was also different between different baiting histories, but not between baited and unbaited treatment areas. No other predator or prey species or species group showed an interaction, nor did any show a difference in PTI between baited and unbaited areas using this approach (Table 1). However, results from this analysis may obscure true prey responses to baiting given the unique combination of experimental design, sampling effort, land system, treatment size, baiting history, baiting context, baiting frequency, fauna assemblage, rainfall conditions and climate trend effects potentially influencing observed fauna responses to baiting at each site. Thus, results for individual `site x species’ responses to top-predator control are described hereafter to explicitly identify any species- and site-specific responses to baiting. Note: ~df values for History = 2, Site(H) = 6, Treatment = 1, T*H = 2, T*S(H) = 6; *df values for History = 1, Site(H) = 2, Treatment = 1, T*H = 1, T*S(H) = 2; ^df values for History = 1, Site(H) = n/a, Treatment = 1, T*H = 1, T*S(H) = 4; insufficient data for koalas and toads. Repeated measures ANOVA yielded no indication that PTI values for prey were consistently lower in areas exposed to periodic poison-baiting for dingoes (Table 2). Demonstrable differences in PTI between treatments were found in only 20 of the 67 `site x prey species’ combinations with sufficient data; in only 11 of these (16% of all cases) was prey PTI lower in baited areas. 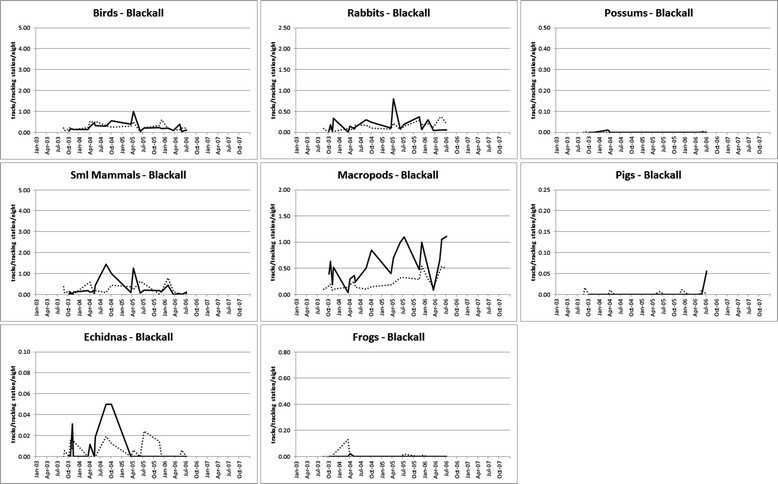 These 11 cases occurred at different sites for a range of mammals and birds (Table 2). Stratifying the data by season likewise indicated no consistently lower prey PTI values in baited areas (Table 3). Demonstrable differences in PTI between treatments were found in only 29 of the 193 `site x season x prey species’ combinations with sufficient data; in only 13 of these (7% of all cases) was prey PTI lower in baited areas. 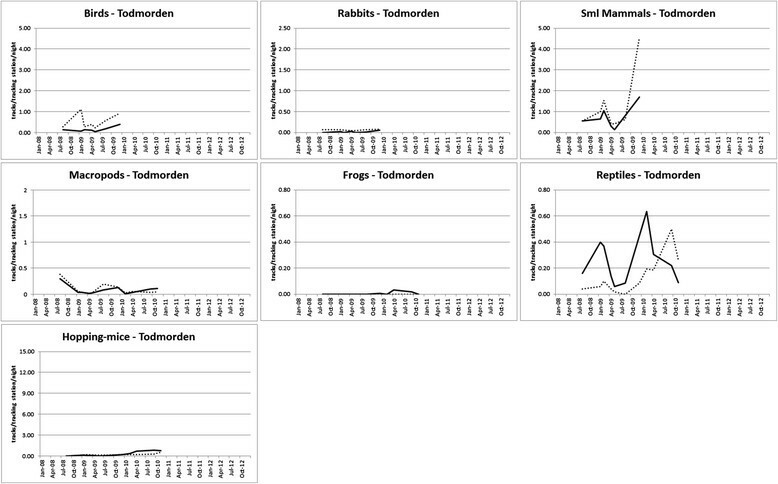 These 13 cases occurred in all seasons except summer, for birds, reptiles and mammals at some sites (Table 3). * = Greater in baited areas; ^ = greater PTI in unbaited areas; NP = not present; ND = known to be present but not detected on tracking plots; NR = present and detected but not recorded; RE = mostly Varanus spp. and reported in ; X = insufficient data to calculate p; #N surveys for hopping-mice at Lambina = 5, error df = 4 for hopping-mice. NP = not present; ND = known to be present but not detected on tracking plots; NR = present and detected on tracking plots but not recorded; RE = Mostly Varanus spp. 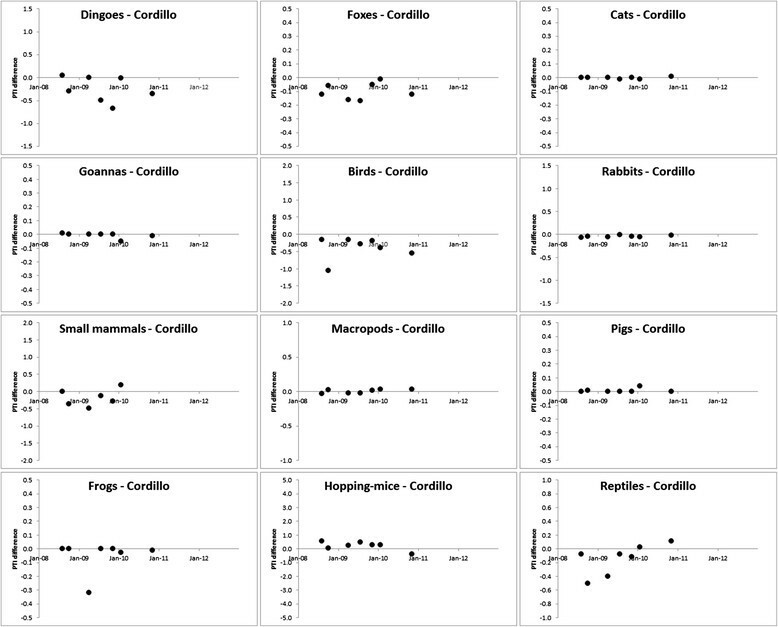 and reported in ; X = insufficient data; *All reptiles except for Varanus spp. (i.e. predominately agamidae and skincidae); ^All dasyurids and rodents except for hopping-mice. A total of 25 baiting events from all sites included post-baiting surveys conducted within four months of baiting from both treatments (mean number of days since baiting = 51). 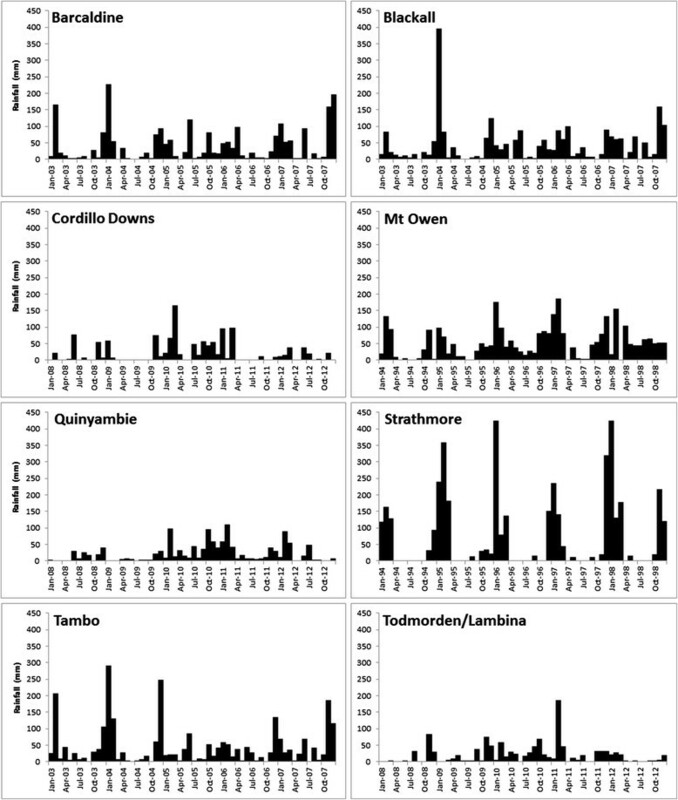 Assessing changes in prey PTI between surveys conducted just prior and subsequent to baiting showed little indication of short-term responses of prey at Mt Owen (N = 8 events), Quinyambie (N = 4 events), Strathmore (N = 5 events) or Todmorden (N = 5 events) (Figure 2). An insufficient number of pre- and post-baiting pairs were available to reliably run this analysis for the other sites. Using this approach, demonstrable changes were only found for birds at Strathmore, where PTI values were lower subsequent to baiting (Figure 2). 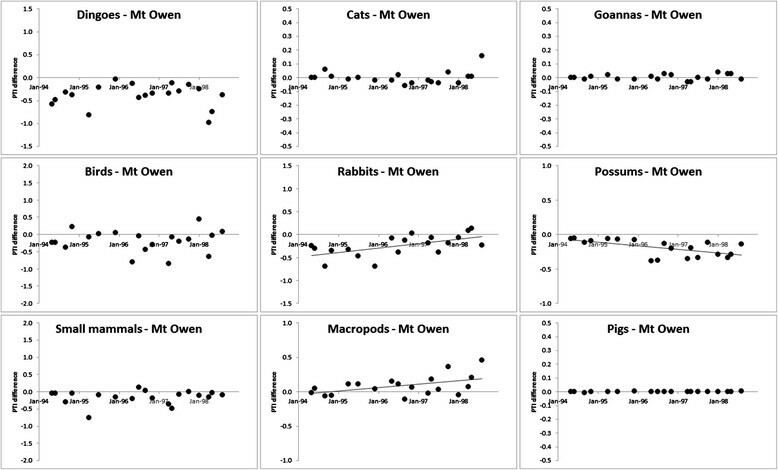 Mean net changes in prey PTI (and 95% confidence intervals) between pre- and post-baiting surveys (conducted within four months of baiting) at Mt Owen (N = 8), Quinyambie (N = 4), Strathmore (N = 5), Todmorden (N = 5) and all sites combined (N = 25), showing little evidence of short-term decreases in prey PTI following dingo control. 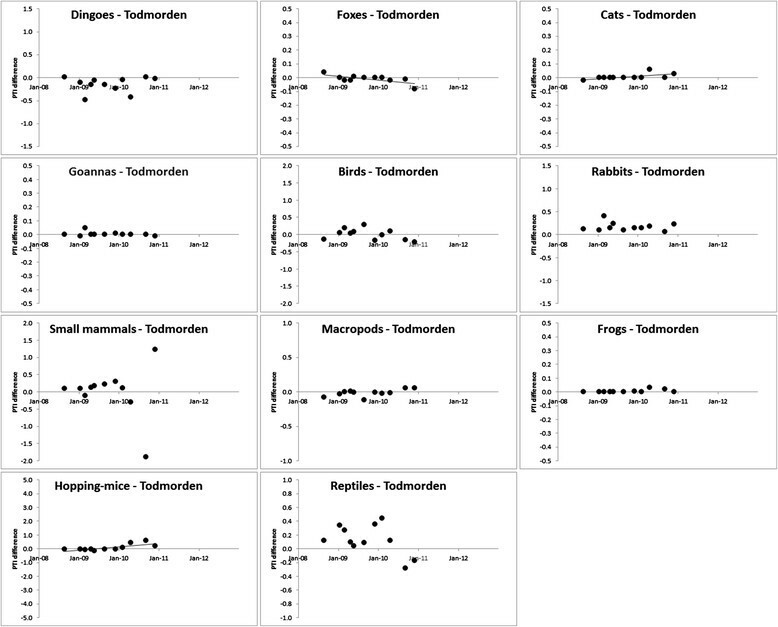 Correlations in longer-term PTI trends between baited and unbaited areas were determined for 62 possible `site x prey species’ combinations (Table 4). Of these correlations, 33 (53% of all cases) were demonstrably positive and the remainder were indistinguishable from zero; no demonstrably negative correlations were observed. For example, birds were positively correlated between treatments at all sites except Quinyambie and Cordillo. 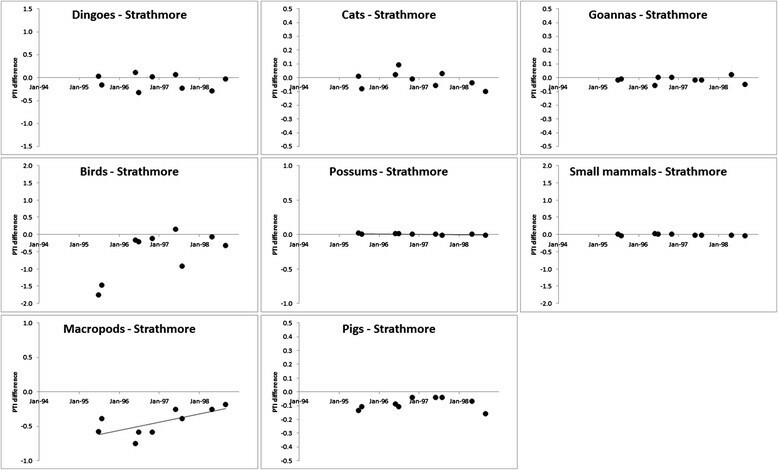 Small mammals were positively correlated between treatments at all sites except Strathmore. 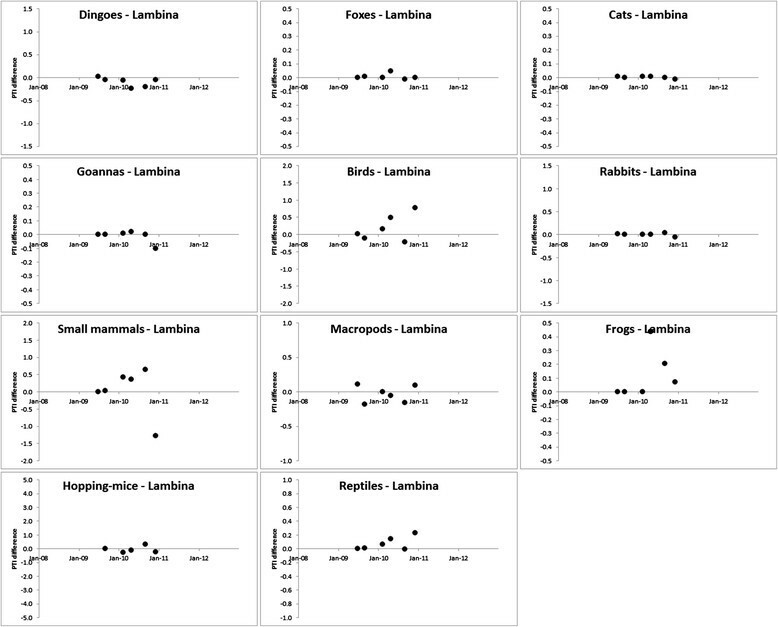 Macropods were positively correlated between treatments at Barcaldine, Blackall, Lambina, Mt Owen and Strathmore, but not Cordillo, Quinyambie, Tambo or Todmorden. No demonstrable correlations between treatments were found for echidnas (Tachyglossus aculeatus) at any site. Of the 33 demonstrable and positive correlations observed, 25 (or 76% of cases) showed r values exceeding 0.75, indicating that the positive correlations observed were typically very strong (Table 4). For example, r approached 1.0 and p = <0.001 in most correlations for hopping-mice (Notomys spp.) and other small mammals. NP = not present; X = insufficient data; Goannas represent only Varanus spp. at Cordillo, Lambina, Quinyambie and Todmorden, but include a small proportion of other reptiles at the other sites (see also ). Divergence or convergence of PTI trends was assessable for 65 `site x prey species’ combinations. Of these, six suggested a demonstrable increase in PTI in baited areas over time, and only three (birds at Quinyambie, and possums at Mt Owen and Strathmore; <5% of all cases) suggested a demonstrable decrease in baited areas over time (Figures 3, 4, 5, 6, 7, 8, 9, 10, 11, 12, 13, 14, 15, 16, 17, 18, 19, 20). No demonstrable changes in PTI differences over time were detected for all other `site x prey species’ combinations. These data demonstrate that longer-term prey PTI trends were typically unaffected by dingo control, instead fluctuating synchronously in baited and unbaited areas over time (Figures 3, 4, 5, 6, 7, 8, 9, 10, 11, 12, 13, 14, 15, 16, 17, 18, 19, 20). Longer-term prey PTI trends in baited (solid lines) and unbaited (dotted lines) areas at Barcaldine (see Table 4 for associated r and p values). Longer-term prey PTI trends in baited (solid lines) and unbaited (dotted lines) areas at Blackall (see Table 4 for associated r and p values). Longer-term prey PTI trends in baited (solid lines) and unbaited (dotted lines) areas at Cordillo Downs (see Table 4 for associated r and p values). 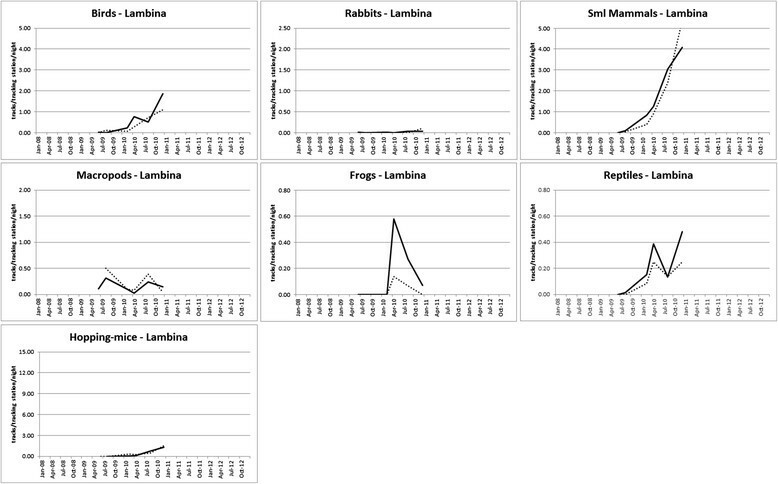 Longer-term prey PTI trends in baited (solid lines) and unbaited (dotted lines) areas at Lambina (see Table 4 for associated r and p values). Longer-term prey PTI trends in baited (solid lines) and unbaited (dotted lines) areas at Mt Owen (see Table 4 for associated r and p values). Longer-term prey PTI trends in baited (solid lines) and unbaited (dotted lines) areas at Quinyambie (see Table 4 for associated r and p values). Longer-term prey PTI trends in baited (solid lines) and unbaited (dotted lines) areas at Strathmore (see Table 4 for associated r and p values). Longer-term prey PTI trends in baited (solid lines) and unbaited (dotted lines) areas at Tambo (see Table 4 for associated r and p values). Longer-term prey PTI trends in baited (solid lines) and unbaited (dotted lines) areas at Todmorden (see Table 4 for associated r and p values). Trends in the predator and prey PTI difference between baited and unbaited areas (baited PTI minus unbaited PTI) over time at Barcaldine. Statistically significant trends (where p = <0.05) are indicated by linear trend lines. Trends in the predator and prey PTI difference between baited and unbaited areas (baited PTI minus unbaited PTI) over time at Blackall. Statistically significant trends (where p = <0.05) are indicated by linear trend lines. 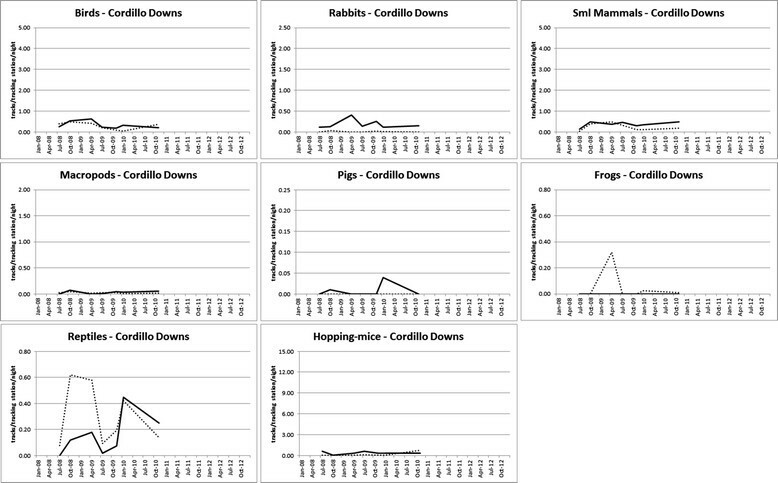 Trends in the predator and prey PTI difference between baited and unbaited areas (baited PTI minus unbaited PTI) over time at Cordillo Downs. Statistically significant trends (where p = <0.05) are indicated by linear trend lines. Trends in the predator and prey PTI difference between baited and unbaited areas (baited PTI minus unbaited PTI) over time at Lambina. Statistically significant trends (where p = <0.05) are indicated by linear trend lines. Trends in the predator and prey PTI difference between baited and unbaited areas (baited PTI minus unbaited PTI) over time at Mt Owen. Statistically significant trends (where p = <0.05) are indicated by linear trend lines. Trends in the predator and prey PTI difference between baited and unbaited areas (baited PTI minus unbaited PTI) over time at Quinyambie. Statistically significant trends (where p = <0.05) are indicated by linear trend lines. Trends in the predator and prey PTI difference between baited and unbaited areas (baited PTI minus unbaited PTI) over time at Strathmore. Statistically significant trends (where p = <0.05) are indicated by linear trend lines. 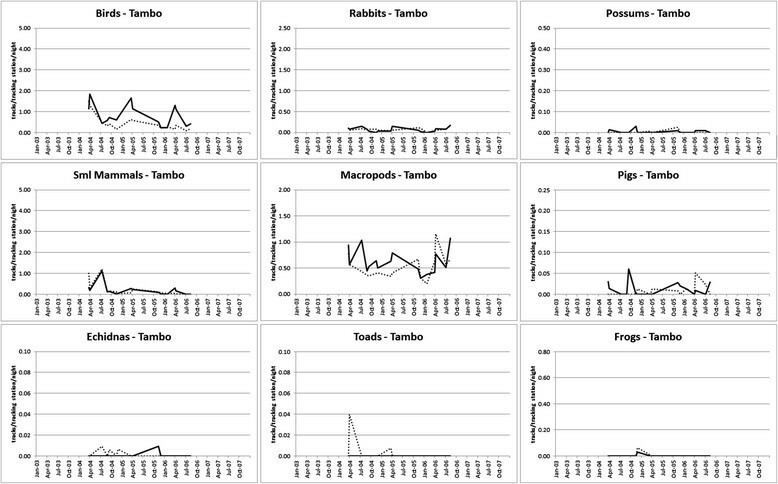 Trends in the predator and prey PTI difference between baited and unbaited areas (baited PTI minus unbaited PTI) over time at Tambo. Statistically significant trends (where p = <0.05) are indicated by linear trend lines. Trends in the predator and prey PTI difference between baited and unbaited areas (baited PTI minus unbaited PTI) over time at Todmorden. Statistically significant responses (where p = <0.05) are indicated by linear trend lines. We previously showed that mesopredator suppression by dingoes was not apparent given that European fox (Vulpes vulpes), feral cat (Felis catus) and goanna (Varanus spp.) trends were not negatively correlated with dingoes over time . However, correlations in longer-term predator PTI trends between baited and unbaited areas were determined here for 33 possible `site x predator species’ combinations (Table 5; see also Figure Two in ). Of these correlations, nine were demonstrably positive (27% of all cases) and the remainder were all indistinguishable from zero. No negative correlations between treatments were detected for any predator at any site (Table 5). The nine demonstrably positive correlations were detected for dingoes, foxes, cats and goannas at different sites (Table 5). Divergence or convergence of predator PTI trends was also assessed here for 35 `site x predator species’ combinations. Of these, cat PTI apparently increased in baited areas at Tambo and Todmorden yet decreased in baited areas at Quinyambie, and fox PTI apparently decreased in baited areas at Todmorden (Figures 12, 13, 14, 15, 16, 17, 18, 19, 20). However, each of these four outcomes seem artificial given that very few cats or foxes were ever observed at these sites (Table 6 and Figure Two in ). Regardless, divergence or convergence of trends was not detected for dingoes (or goannas) at any site (Figures 12, 13, 14, 15, 16, 17, 18, 19, 20), demonstrating that (1) dingo PTI trends were unaffected by dingo control over time and (2) observed convergence or divergence of mesopredator PTI trends in these four cases could not be related to changes in dingo PTI trends. NP = not present; ND = known to be present but not detected on tracking plots; BP = believed present but not detected on tracking plots; NR = present and detected on tracking plots but not recorded; RE = Mostly Varanus spp. and reported in ; *All reptiles except for Varanus spp. (i.e. predominately agamidae and skincidae); ^All dasyurids and rodents except for hopping-mice; N surveys per site are given in Table 2. * = Greater in baited areas; ^ = greater PTI in unbaited areas; NP = not present; ND = known to be present but not detected on tracking plots; NR = present and detected but not recorded; RE = mostly Varanus spp. and reported in ; X = insufficient data to calculate p; #N surveys for hopping-mice at Lambina = 2, error df = 1 for hopping-mice. Our results provide demonstrable experimental evidence that the prey populations we monitored are very rarely affected negatively by contemporary dingo control practices in the beef cattle rangelands of Australia. Baiting history was important only to macropods (Table 1). Overall mean prey PTI was seldom lower in baited areas than in paired unbaited areas (Tables 2 and 3). Short-term declines in prey PTI in baited areas (relative to unbaited areas) also occurred rarely (Figure 2). Longer-term prey PTI trends fluctuated similarly in baited and unbaited areas in each case (Table 4, Figures 3, 4, 5, 6, 7, 8, 9, 10, 11). Divergence or convergence of prey PTI trends was seldom observed (Figures 12, 13, 14, 15, 16, 17, 18, 19, 20). These non-effects of baiting were consistent across sites and site histories, environmental contexts, and across assemblages of different ground-dwelling exotic or native and small or large mammalian, avian, reptilian and amphibian prey assessed. Indeed, the few `significant' differences observed in Steps 1, 2 or 3 of our analyses occurred infrequently and sporadically enough across sites and taxa that they may well have occurred simply by chance. If contemporary dingo control practices truly had detrimental effects on prey abundances, through either numerical and/or functional changes in predator populations, then: (1) prey PTI should have been lower in baited areas and/or (2) should have declined immediately after baiting and/or (3) should have been negatively correlated between baited and unbaited areas and/or (4) should have shown evidence of decreasing PTI trends in baited areas over time. Rarely did any of these occur for any prey species at any site, and never did our results of Step 3 show evidence of baiting-induced PTI decline for any threatened prey species or species group, such as hopping-mice or other small mammals (Figures 3, 4, 5, 6, 7, 8, 9, 10, 11, 12, 13, 14, 15, 16, 17, 18, 19, 20). Perhaps our best evidence of baiting-induced changes in prey populations comes from Mt Owen, where a unique combination of baiting history, baiting context, land system, mammal assemblage, rainfall and climate trend suggested that some prey species were affected by dingo control in that given context. Our experiment began at Mt Owen during a period of drought and continued through a period of repeated above-average seasonal conditions when several predator and prey species showed evidence of somewhat linear and bottom-up driven PTI increases in response to rainfall (compare Figures 7, 16 and 21 and Figure Two in ). This heterogeneous and structurally complex dry woodland site also supported a relatively high diversity of mammalian prey species of various sizes, including several macropod species -. The relative abundance of dingoes, cats and goannas increased in both baited and unbaited areas over the course of the study there (Table 5, and Figure Two in ), and were numerically unaffected by baiting (Figures 7 and 16). 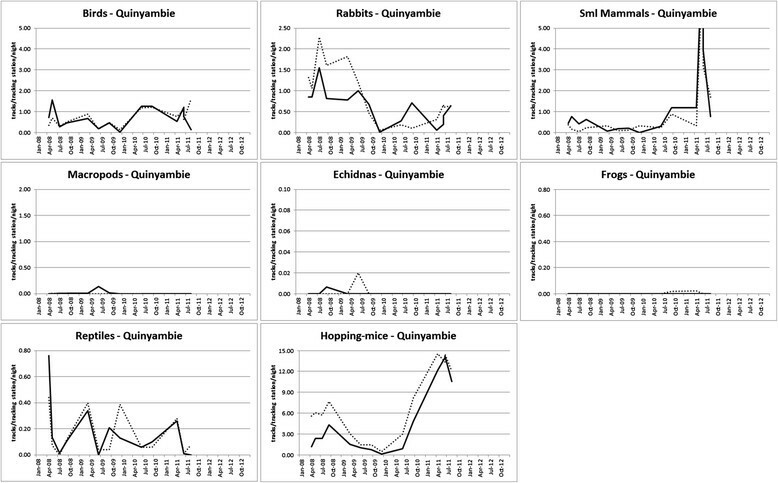 In this context, however, macropods and rabbits (Oryctolagus cuniculus) increased in the baited area where possums (Trichosurus vulpecula) decreased (Figures 7 and 16); all other taxa showed no evidence of baiting-induced changes in PTI trends. Possums (53% occurrence), macropods (29% occurrence) and rabbits (7% occurrence) were the three most frequently occurring prey species in dingo diets at Mt Owen, where dingoes switched seasonally between macropods and possums ,. These observations suggest that baiting-induced changes to dingo populations can occur in some contexts, whereby large macropod prey can become unavailable (or uncatchable) to socially-fractured dingo populations exposed to baiting, which then must switch to alternative prey more easily captured ,. In this case, dingoes exposed to baiting appeared to suppress populations of common possums, but not any other more threatened small mammal species. The historical decline of possums in the Australian rangelands has previously been attributed to dingo predation -. Whether or not these baiting-induced prey responses are sustained subsequent to a change in the ecological context is unknown, but unlikely, given that baiting-induced functional changes in dingo movement behaviour  or prey selection (B. Allen, unpublished data from ,) did not occur at several other sites where these processes were investigated (Table 4, Figures 3, 4, 5, 6, 8, 9, 10, 11, 12, 13, 14, 15 and 17, 18, 19, 20). These variable results suggest that the few numerical changes we observed in some of the preferred dingo prey species at some sites may be related to context-specific functional changes to dingo populations subjected to baiting, which might sometimes occur. Monthly rainfall trends (mm rain) over the study periods at the nine study sites. Although patterns in prey PTI were typically unaffected by dingo control, it is possible that prey behaviour might have been altered - perhaps negatively - through changes to the landscape of fear ,,. In other words, baiting-induced changes to dingo function (if or when it occurs) might allow mesopredators to forage more freely and then increase predation pressure on prey, negatively affecting prey behaviour and fitness ,,. Changes to the landscape of fear might occur independently of numerical trends in predator populations. Step 2 of our analyses provided the greatest opportunity to assess the behavioural responses of prey to predator control, yet short-term changes in prey PTI were not apparent in most cases (Figure 2). Comprehensive reviews of the short-term effects of dingo control on prey concur with our results to show that populations of non-target prey are not negatively affected by dingo control ,. Specifically investigating the behavioural responses of prey to dingo control, Fenner et al. likewise found no change in small mammal prey behaviour following baiting. The predator manipulation experiments conducted by Eldridge et al. similarly show prey populations (such as birds and reptiles) to fluctuate independent of dingo control. Modelling the outcomes of dingo reintroduction and cessation of fox control on prey fauna in forested temperate areas by Dexter et al. also suggests small mammal populations fluctuate largely independent of dingoes. Whereas, the predator exclosure experiments of Kennedy et al. suggest that some small mammal prey of dingoes benefit from dingo exclusion, as predicted by Allen and Leung . The predator exclosure experiment of Moseby et al. showed that some rodents benefited from the removal of rabbits, dingoes and other predators, whereas reptiles, dasyurids and other rodents were largely unaffected by their exclusion. If baiting-induced behaviourally-mediated trophic cascades were occurring at our sites, such changes were not manifest as numerical effects on longer-term prey abundance trends in most cases (Tables 1, 2 and 3, Figures 3, 4, 5, 6, 7, 8, 9, 10, 11). These results contradict perceptions (reviewed in ,) that (1) prey population abundances are lower in baited areas, (2) prey activity is suppressed shortly after baiting, (3) commencement of baiting produces declines in prey abundances, and (4) cessation of baiting increases prey abundances. Long-term (10-28 years) correlative studies of dingoes, mesopredators and their prey concur with these experimental results (e.g. ,), and "almost all available studies reporting dissimilar results are based on demonstrably confounded predator population sampling methods and/or low-inferential value study designs that simply do not have the capacity to provide reliable evidence for dingo control-induced mesopredator release" (, pg. 4). Thus, not only is there a clear absence of reliable evidence for dingo control-induced trophic cascades (e.g. ,), but there is also a strong and growing body of demonstrable experimental evidence that prey populations are usually affected positively (not negatively) by dingo control if prey are affected at all (e.g. ,, this study). Trophic cascade and mesopredator release theory predicts that declines of top-predators produce increases of mesopredators and larger herbivores, which then produce declines in smaller prey, which are often threatened ,. The theory appears to work best in reality when food webs are simpler and less complex ,. Deriving their conclusions from desktop studies, snap-shot field studies and/or those conducted on fauna on other continents, some have predicted that dingo control will release feral pigs (Sus scrofa), macropods and rabbits from dingo suppression, which will then simultaneously reduce the abundances of hopping-mice and other small mammals, birds and other fauna ,,. Thus, top-predator management programs that kill, remove or alter the function of top-predators might conceivably produce indirect declines of threatened fauna ,. Despite the potential for substantial and direct negative effects of dingoes on the same threatened fauna through predation ,,,, such predictions have led some to advocate cessation of dingo control programs with the expectation that doing so will provide widespread net benefits to threatened fauna at lower trophic levels (e.g. ,,). 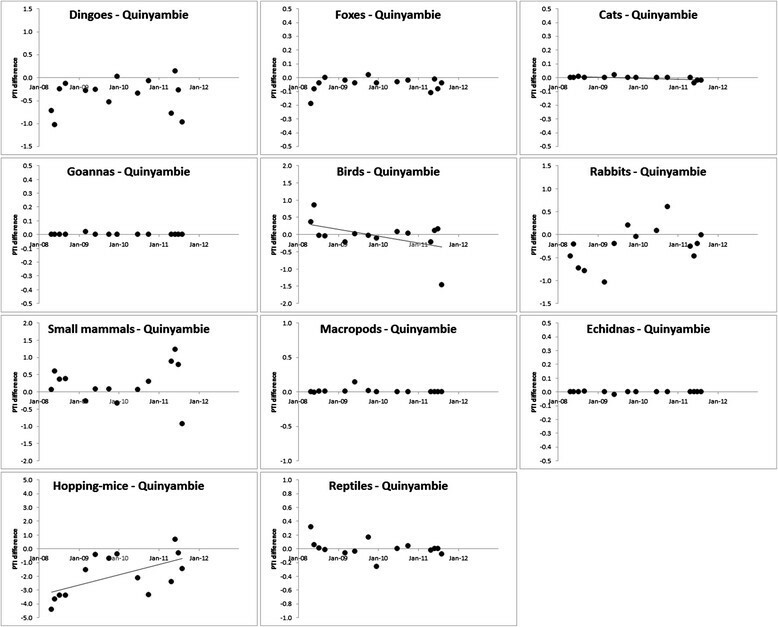 However, our simultaneous assessment of the effects of dingo control on predator and prey populations demonstrated that the predicted mesopredator increases do not occur (Table 5 and Figures 12, 13, 14, 15, 16, 17, 18, 19, 20; see also Figure Two in ) because contemporary dingo control practices "do not appear to suppress dingo populations to levels low enough and long enough for mesopredators to exploit the situation" (, pg. 11). 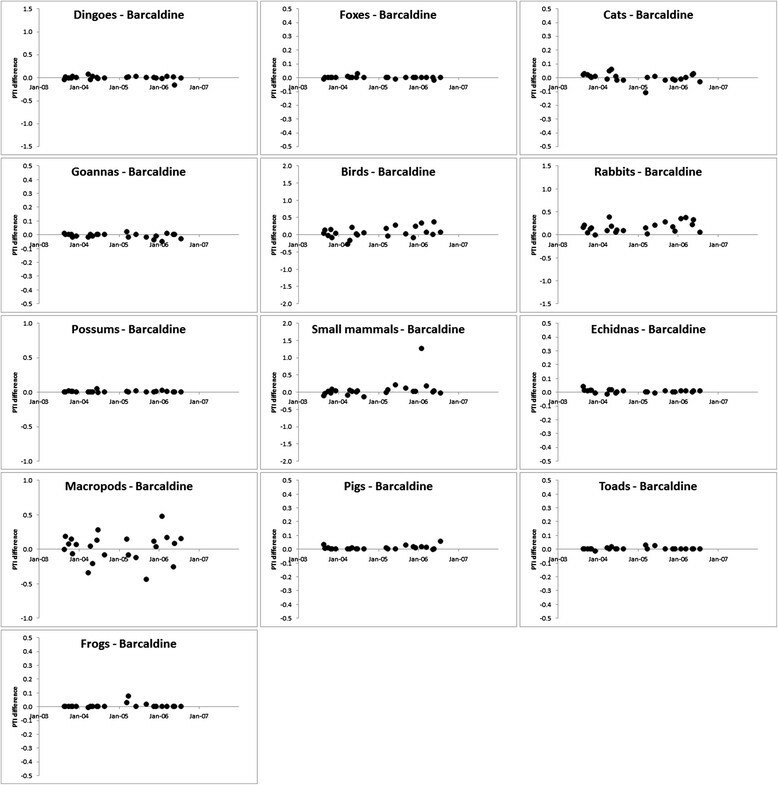 Hence, the consistent absences of negative prey responses to dingo control we found (Tables 1, 2 and 3, Figures 2, 3, 4, 5, 6, 7, 8, 9, 10, 11, 12, 13, 14, 15, 16, 17, 18, 19, 20) should be entirely expected given that the prerequisite first step or trigger for the predicted trophic cascade (i.e. dingo decline) did not occur (Figures 12, 13, 14, 15, 16, 17, 18, 19, 20). Whatever the relationships between dingoes and mesopredators or prey are, they do not appear to be affected by contemporary dingo control practices to any substantial degree. Alternative dingo control strategies which actually achieve sustained reduction of dingo abundances and/or alteration of dingo function may produce different results that might lend support to popular predictions of dingo control-induced trophic cascades or mesopredator release . Although the occurrence of trophic cascades is well demonstrated ,, whether or not they are caused by top-predators or top-predator control is far less certain ,, and undoubtedly context-specific. For example, results of studies conducted on big cats, bears or wolves in temperate mountainous areas with diverse mammal assemblages largely untouched by humans are not easily transferable to other predators occupying the severely human-altered areas that dominate the earth's surface , such as dingoes and the relatively depauperate mammal assemblages in the beef cattle rangelands of Australia . Moreover, by undertaking applied-science experiments which circumvent investigations of the internal processes at play and instead focus on the actual in situ prey responses to top-predator control (R6 in Figure 1) - what Kinnear et al. label the `black box’ approach - our results confirm that prey populations are typically unaffected by contemporary dingo control practices independent of how predators and prey might interact with each other (R2 in Figure 1). Our findings are in accord with what is known from other predator manipulation experiments worldwide. Fauna at lower trophic levels are unlikely to respond positively to lethal control where (1) multiple predators are removed (i.e. dingoes and foxes are both susceptible to and targeted by baiting ) (2) the efficacy of predator removal is low (i.e. 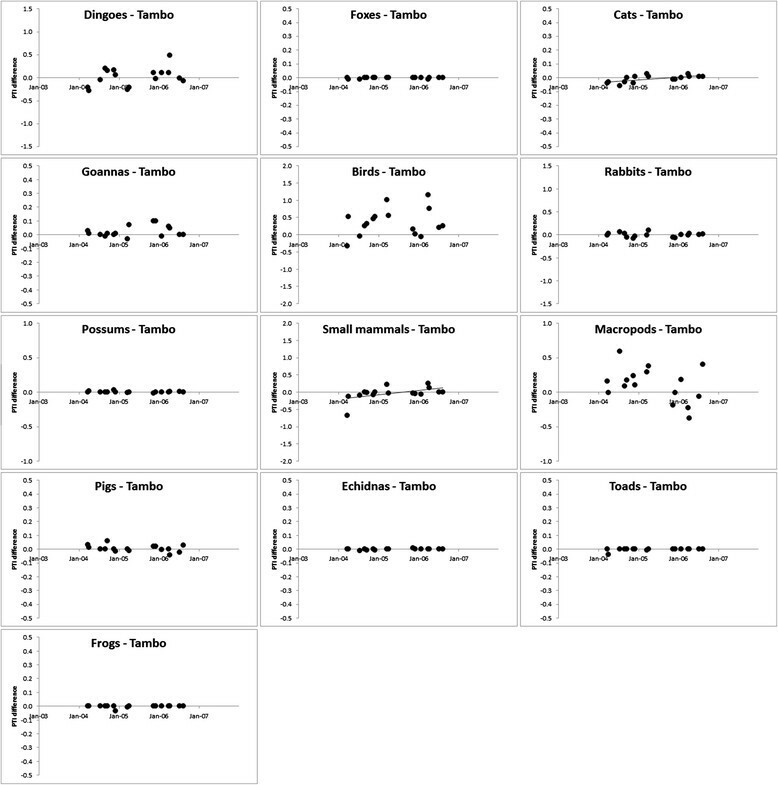 where predator populations are resilient to lethal control over time, as in Table 5 or Figures 12, 13, 14, 15, 16, 17, 18, 19, 20; see also  or Figure Two in ), and/or where (3) the fauna are not the primary prey species of the predator (; but see , for information on dingo diets at our sites). Though small and medium-sized mammals (such as rodents, possums and rabbits) are preferred prey for dingoes and other mesopredators alike when available ,, fluctuations in the availability of a variety of prey species typically mean that suppression of a given prey species is often only temporary ,,. Besides targeting multiple predators and producing no lasting changes in predator PTI trends in our experiments (Table 5, Figures 12, 13, 14, 15, 16, 17, 18, 19, 20), the flexible and generalist nature of dingoes’, foxes’, cats’ and goannas’ prey preferences may be another reason why we did not detect changes in prey PTI trends following predator baiting. A large array of factors can influence the outcomes of predator control on prey populations ,,. The number and type of intraguild predators present, the variety and abundance of available prey, the environmental context in which predator control is undertaken, the responses and resilience of predators to that control, the dietary preferences and habits of predators, and the resilience of prey to changes in predator numbers or behaviour are each important factors influencing the responses of prey to predator control -. Study design and analytical approach also influences the observed outcomes given that `what you see depends on how you look’ (e.g. ,,,). Changes in prey abundances following predator control might only be expected where or when predation is actually the limiting factor for prey ,. Many of Australia’s threatened fauna are affected to a greater degree by much more than just predator effects ,,-, suggesting that alteration of predator communities or predator control strategies - in isolation of other, more important drivers of prey decline - might not be universally expected to enhance prey recovery ,. The timeframe over which prey are monitored may also influence the observed prey responses to predator baiting. Snap-shot studies with a single observation conducted at only T0 (e.g. -) obviously have no capacity whatsoever to measure a spatial or temporal `change’, `shift’ or `response’ to dingo control ,, which is why we conducted multiple surveys over multiple successive years at each site (T0, T1, T2- up to T23; Table 2). Despite conducting our experiments over these timeframes, similar to most other predator manipulation experiments , it is possible that 2-5 years of repeated prey surveys might not be long enough to detect changes in prey abundances following predator removal . However, three lines of evidence suggest that this is not the case for our data. First, the PTI methodology we applied was sufficient to detect the immediate and longer-term responses of prey (and predators) to the bottom-up effects of rainfall within the timeframe covered (Figures 3, 4, 5, 6, 7, 8, 9, 10, 11, 12, 13, 14, 15, 16, 17, 18, 19, 20, 21; see also ,). Some claim that the top-down effects of dingo control can be stronger than the bottom-up effects of rainfall in the systems we studied , so such predicted negative responses of prey to baiting should have been observable. Second, prey responses to dingo control are almost always investigated using observational snap-shot studies or correlative studies of <12 mo duration ,, implying that 2-5 years of repeated baiting and population monitoring across spatial scales several orders of magnitude larger should have readily detected both acute and chronic prey declines. 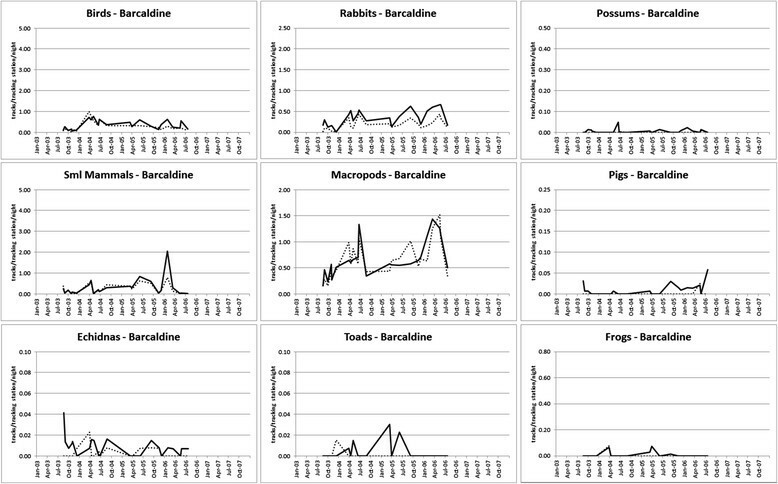 Third, prey population trends fluctuated similarly between treatments at Barcaldine, Blackall and Tambo (Table 4, Figures 3, 4, 5, 6, 7, 8, 9, 10, 11, 12, 13, 14, 15, 16, 17, 18, 19, 20) where baiting had occurred multiple times each year for over 10 years . Viewed in isolation, this latter result might be interpreted to suggest that prey had already declined in baited areas and was now being held below their carrying capacity; however, shorter-term declines were not apparent (Table 4, Figures 3, 4, 5, 6, 7, 8, 9, 10, 11), baiting history was not important to most species (Table 1), overall mean prey PTI was not lower in baited areas for any prey at any of the three Blackall sites (Table 2), and nor were predator PTI trends altered by baiting at these sites either (Table 5, Figures 12, 13, 14, 15, 16, 17, 18, 19, 20, and Figure Two in ). These lines of evidence indicate that our experimental design was sufficient for detecting baiting-induced changes in prey PTI if they were occurring . The utility of our fauna sampling method (i.e. road-based sand plots) is also likely to vary between species and species groups ,. This may be one reason why the number of tracks observed, and hence PTI values, for some species were low on occasion (Table 6; see also Table Six in ) and why their analyses yielded no significant responses to baiting (Tables 1, 2, 3, 4 and 5). However, the variable utility of the technique for different species is also of little consequence to our overall conclusions. Far from being a weakness of our study, the observance of few footprints for some species at times (confirming their presence at the study sites) is itself a key result supporting our conclusions given that the number of observations (or PTI values) did not change substantially over time in response to dingo baiting (Figures 3, 4, 5, 6, 7, 8, 9, 10, 11, 12, 13, 14, 15, 16, 17, 18, 19, 20; see also ). Our expectation was that if baiting-induced mesopredator releases or prey suppression was occurring (see Predicted outcomes, below), then these responses should have been detectable on the 92-166 sand plots interspersed throughout the treatment areas on dirt roads at each site (Note: `roads’ here are simply the two 4WD vehicle wheel tracks that wind throughout the study sites with negligible disturbance or alteration to the extant habitat). To argue that our sampling methodology was unable to detect changes in fauna PTI is to imply that mesopredator releases or prey suppression was occurring elsewhere, or that observed predator-prey interactions were somehow different on and off the road. This is unlikely given that the activity of almost all the prey species we monitored (e.g. macropods, rabbits, small mammals, birds, reptiles etc.) occurs randomly with respect to roads at our sites, unlike the mammalian predators whose behaviour is influenced by roads ,. Moreover, supplementary studies indicated that baiting did not affect dingo movement behaviour, which was similar both on and off the road just prior and subsequent to baiting . Sampling fauna populations by placing tracking plots on roads is by no means `insensitive’ or of little value just because the approach may produce lower PTI values for some species relative to other tracking plot placements or sampling approaches, providing fauna populations are not below the level of detection by the method. Although some species (e.g. cats, small mammals or reptiles) may have persisted below the level of detectability on roads under certain conditions (e.g. 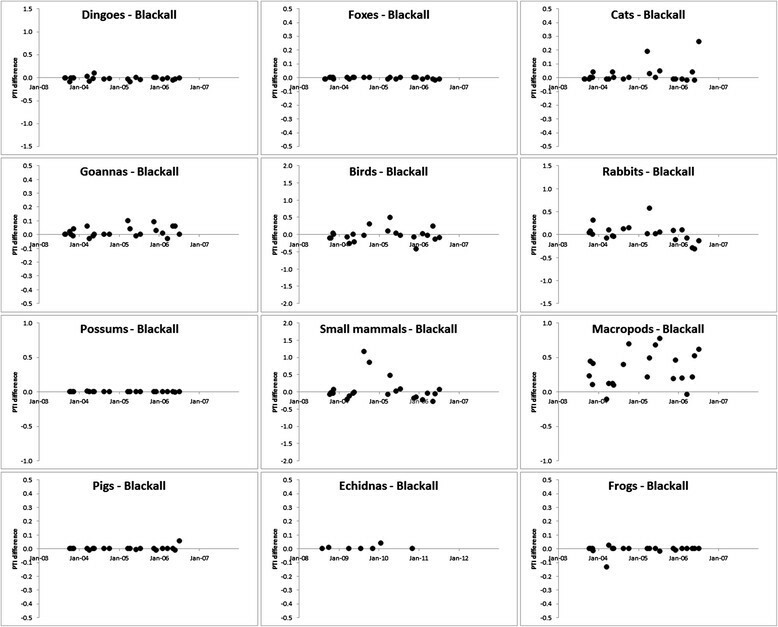 during drought for small mammals or during winter for reptiles), such species were readily detected again on roads when these conditions changed (compare Figures 3, 4, 5, 6, 7, 8, 9, 10, 11 and 21; see also ). Thus, Step 3 in our analytical approach (Figures 3, 4, 5, 6, 7, 8, 9, 10, 11, 12, 13, 14, 15, 16, 17, 18, 19, 20) should have detected predator and prey PTI responses to baiting if they were occurring, regardless of the variable utility of road-based tracking plots for different species. Although we undertook our study in an experimental framework inclusive of buffer zones to maximise treatment independence, it is also important to remember that our approach was an evaluation of the overall population-level responses of prey to contemporary top-predator control practices under real-world environmental conditions where predators and prey were each capable of dispersal and migration between treatments over time. In other words, we sought not to compare nil-treatment areas to paired treated areas with `X% reduction of predators’ or `X density of baits’, but with `contemporary dingo control practices’. This applied-science focus therefore produces results that reflect the in situ outcomes of contemporary dingo control practices in the beef-cattle rangelands present across much of the Australian continent. Dingo control strategies that actually achieve complete and sustained dingo removal from the landscape (such as those that include exclusion fencing and eradication) may produce different results, though such strategies are unlikely to ever occur in the >5.5 million km2 (or ~75%) of Australia where sheep (Ovis aries) and goats (Capra hircus) are not commercially farmed . Our results add to the growing body of experimental evidence that prey populations in rangeland Australia are not negatively affected by contemporary dingo control practices through trophic cascade effects. These findings broaden our understanding of the potential outcomes of predator control on prey fauna at lower trophic levels and have important implications for the management of dingoes and threatened fauna. Given the ineffectiveness of contemporary baiting practices at sustainably reducing dingo populations, it might be concluded that dingo control is a pointless waste of time, money and dingoes, which may even be counter-productive to cattle producers at times ,. Importantly however, dingo control is typically undertaken to reduce or avert damage to livestock by dingoes, not to reduce dingo densities per se, and the relationship between dingo density and damage is not well understood ,. Hence, the `effectiveness’ of dingo control should ultimately be measured in terms of `damage reduced’ or `losses averted’, not in terms of `% reduction in dingo PTI’, `% dingoes destroyed’, `% people participating in dingo control’, or the `% of land area exposed to control’ ,. Greater emphasis on measurable damage reduction and/or mitigation appears warranted in order to ethically justify continued dingo control programs. Some have also theorised that simply ceasing lethal dingo control is a `free’ or cost-effective strategy able to increase the abundances of threatened prey fauna populations of conservation concern through trophic cascade effects (e.g. ,,,,), but our results demonstrate that such actions do not produce such outcomes. Fauna recovery programs should more carefully consider the factors limiting threatened prey populations of interest and the general indifference of predator and prey populations to contemporary dingo control practices before altering current predator control strategies. We conclude, as have others (e.g. ,,), that proposals to cease dingo control are presently unjustified on grounds that contemporary dingo control somehow harms prey fauna through trophic cascade effects. Our experimental results should be valuable for informing dingo and threatened fauna management plans given that "the majority of work to date has been largely observational and correlative" (, pg. 64; see also ,). Future studies might focus on measuring predator control-induced changes in the behaviour of predators (such altered foraging times, prey preferences and space use) and prey (such as selection of non-preferred or safe resources of lesser quality) that may have subtle effects on prey fitness and long-term population viability not detectable in our experiments. Our investigation of the relationships between dingo control and prey (R6 in Figure 1) occurred simultaneously with our investigation of the relationships between dingo control and predators (R1, R2 and R4 in Figure 1), as previously reported in Allen et al. . As such, our description of the methods used in the present study is based heavily on that study. All procedures described were sanctioned by the relevant animal care and welfare authorities for each site (Queensland Department of Natural Resources’ Pest Animal Ethics Committee, PAEC 930401 and PAEC 030604; South Australian Department of Environment and Heritage’s Wildlife Ethics Committee, WEC 16/2008). We conducted a series of large-scale, multi-year, predator-manipulation experiments on extensive beef-cattle producing properties in five different land systems representing the breadth of the beef-cattle rangelands of Australia, where mean rainfall varied from 160-772 mm annually, or from arid to tropical areas (see Figure Seven and Table Six in ). Seasonal conditions fluctuated between periods of above- and below-average rainfall, or between drought and flush periods at each site during our experiments (Figure 21). Using paired nil-treatment areas without dingo control for comparison (see Figure EightA in ), we examined the relative abundances of prey (and predators) in paired areas subjected to periodic broad-scale poison-baiting for dingoes at six of nine study sites (Strathmore, Mt Owen, Cordillo Downs, Quinyambie, Todmorden and Lambina; see Table Six in ), referred to as the six experimental sites. Aerial and/or ground-laid sodium fluoroacetate (or `1080’) poison-baits were distributed individually (spaced at least 300 m apart) along landscape features (e.g. drainage lines, ridges, fragment edges etc.) and/or unformed dirt roads or tracks according to local practices and regulations up to five times each year (typically once in spring and again in autumn at the six experimental sites, and every 2-4 months continuously at the other three sites). Baits were distributed over a 1-2 day period to a midway point in the buffer zone between treatments (described below; see also Figure EightA in ). Each bait weighed 100-250 g and contained at least 6 mg of 1080, sufficient to kill adult dingoes, foxes or cats if consumed soon after bait distribution . Such spatially and temporally sporadic baiting practices are common, occur widely across Australia, and are considered the only effective dingo and fox control tool used in rangeland areas ,. Populations of all other extant fauna at our sites are typically not susceptible to such baiting practices because they are either tolerant of the toxin at the low-level doses used in dingo baits and/or rarely consume carrion-like baits, preferring live prey instead (e.g. ,,). Experimental treatment (i.e. baited) and nil-treatment (i.e. unbaited) areas were randomly allocated. Treatment and nil-treatment areas were also replicated in some land systems (see Table Six in ). Hone  defines this study design as an `unreplicated experiment’ or a `classical experiment’ for our site with replication (i.e. Todmorden and Lambina might be considered a single site with two treatments and two controls). Both treatment and nil-treatment areas at three of the six experimental sites were historically exposed to baiting up until the commencement of the experiment, whereas, both treatment and nil-treatment areas were not historically exposed to baiting at the other three experimental sites (see Table Six in ). Such different baiting histories were necessary to investigate the responses of prey to either the commencement or cessation of baiting, or to the `removal’ or `addition’ of predators (i.e. dingoes and foxes were killed at some sites or allowed to increase at others). The other three sites (Barcaldine, Blackall and Tambo; referred to as the Blackall sites) were monitored for a similar length of time (see Table Six in ), but differed from the six experimental sites in that the treatments and nil-treatments had already been established for over 10 years and they did not have buffer zones between them (see Figure EightB in ). This allowed an assessment of the longer-term outcomes of dingo control. Treatment size, independence and baiting practices therefore varied between the nine sites in order to deliver in situ tests which reflected contemporary dingo control practices within each bioregion. Experiments were conducted at large spatial scales, where the size of the total treatment and nil-treatment area at each of the nine sites ranged between 800 km2 and 9,000 km2, or 45,600 km2 in total (see Table Six in ). The mean property size of properties that bait in north Queensland (where several of our study sites were located) is 400 km2, and is substantially less elsewhere in Queensland (Queensland Department of Agriculture, Forestry and Fisheries, unpublished data). The size of the baited treatment areas sampled in our experiments ranged from 400 km2 to 4,000 km2 (Table Six in ). Thus, the sizes of our baited treatment areas represent areas of similar size or up to 10 times larger than those commonly subjected to baiting. Each site was separated by 100-1,500 km, except in the case of Todmorden and Lambina, which were neighbouring properties (see Figure Seven in ). Prey populations were simultaneously monitored in treatment and nil-treatment areas using passive tracking indices (PTI; ), which are commonly used to monitor a variety of ground-dwelling mammals, reptiles and birds both in Australia and elsewhere around the world (e.g. ,,,-. We monitored populations of native and exotic amphibians, reptiles, ground-foraging birds and mammals of various sizes from small rodents (~15 g) to large herbivores such as kangaroos (Macropus spp.) and feral pigs using this technique. Larger feral herbivores (e.g. camels Camelus dromedarius, donkeys Equus asinus, and horses Equus caballus) were also recorded on sand plots on a few occasions, but were excluded from analyses because PTI values for these species are confounded by the effects of humans (e.g. culling and harvesting actions), and nor are these very large species likely to be affected by dingoes to any great degree, or vice versa . PTI surveys were conducted several times each year at each site and were repeated at similar times each subsequent year over a 2-5 year period (see Table Six in ). At the Blackall sites, between 92 and 166 passive tracking plots (or `sand plots’) were spaced at 1 km intervals along unformed vehicle tracks. At the six experimental sites, 50 plots each were similarly established in both the treatment and nil-treatment areas (i.e. 100 plots per site). For any given survey, plots in both treatments were read and refreshed at the same time daily by the same experienced observer and were monitored for up to 10 successive days (usually 2-5). The location of the first tracking plot in each treatment area was randomly allocated and plots were distributed throughout a similar suite of microhabitat types in both treatment areas. Plots rendered unreadable to one or more species by wind, rain or other factors were excluded from analyses. All predator and prey track intrusions were counted (i.e. a continuous measure). However, the tracks of irruptive small mammals and hopping-mice were limited to a maximum value of 15 tracks per plot per day, which represented saturation of the sand plot with their tracks (i.e. their populations were super-abundant). PTI values for a given survey therefore represented the mean number of prey track intrusions per sand plot tracking station per 24 hr period (i.e. the mean of daily means; ). PTIs collected in this way can be reliably interpreted as robust estimates of relative abundance if analysed appropriately (e.g. ,,, but see  for an alternative view). At least one PTI survey was conducted before the imposition of treatments (i.e. before commencement or cessation of baiting in a given treatment) at the six experimental sites to identify any underlying spatial variation in prey population abundances between treatments prior to manipulations. Tracking plot transects at these six sites were separated by a buffer zone 10-50 km wide to achieve treatment independence during individual surveys (see Figure Eight in ). The appropriate width of the buffer zone at each site was based on the width of 1-2 dingo home ranges in the study areas (e.g. ,,). Tracking plots were located no closer than 5-25 km from the edge of the treatment area (i.e. half the width of the buffer zone) to minimise potential edge effects. Overall, we obtained 35,399 plot-nights of tracking data from 128 surveys conducted over 31 site-years (Table 6; see also Table Six in ). Given that each site represented a unique combination of factors including experimental design (experiment or correlation), sampling intensity (N surveys ranged from 6-23), mean annual rainfall (160-772 mm), land system (five different types), treatment size or scale (800-9,000 km2), baiting context (five different types), baiting frequency (three different types), baiting history (three different types), climate trend during the study period (three different types), and the decade the study was conducted (different sites were sampled up to 30 years apart), reliably assessing their relative effects separately was not possible for most of these factors. Moreover, a given species (e.g. dingoes) or species group (e.g. small mammals or birds) is also not reliably comparable across sites ,. In the case of species groups, actual PTI values may represent different species (e.g. rodents or dasyurids), which may have completely different life histories  and expected responses to predator control. Food web complexity also alters the expected outcomes of predator population changes ,, which is why individual species also exist within a unique fauna assemblage that is not equal or comparable across sites. For example, house mouse (Mus musculus) populations living at a site with only one common predator and one common rodent competitor (e.g. 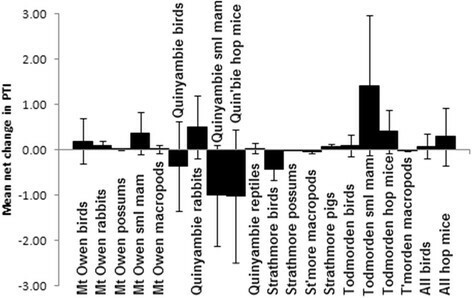 Quinyambie) are unlikely to respond to predator control in the same way as a house mouse population at a site with three common predators and multiple small mammal competitors (e.g. Mt Owen). Furthermore, prey could not be reliably grouped into functional groups such as `dingo prey’, `fox prey’, `cat prey’ or `not preyed upon by predators’ given that each of these predators are generalists and have extensive dietary overlap (i.e. they each eat and threaten the same prey species; -, but see ). For these reasons, different species or species groups cannot be considered equal between sites and should not be pooled across sites as if they were equal. These limitations meant that only `baiting history’ and `treatment’ offered reliable variables on which to block or pool data across sites, for a given species or species group. Thus, to avoid a complicated variety of site-, context- and species-specific analytical approaches, we consistently applied a conservative three-step logical approach to examine the effects of lethal dingo control on sympatric prey populations at each site. In Step 1, we first used linear mixed model analyses (using SAS PROC MIXED) to investigate the influence of baiting history (i.e. historically baited in both treatments before cessation of baiting in the unbaited area, historically unbaited in both treatments before baiting commenced in the baited area, or consistent baiting histories for over 10 years; N = 3 properties for each), treatment (baited or unbaited) and their interaction on both the overall mean and median PTI for predators and prey. Medians were assessed to address potential issues related to the non-symmetrical distributions of PTI values for some species . Means were assessed for comparative purposes. Results from these analyses yielded little useful information for determining the responses of prey to predator control because the other factors identified above hide or confound any responses that might actually be present. Thus, subsequent analyses focused in detail on individual `site x species’ combinations in order to explicitly identify which (if any) species responded to dingo control at a given site. We then compared the mean PTI of prey (both overall and also stratified by season) between baited and unbaited areas at each site using repeated measures ANOVA. That the data are `approximately normally distributed’ is one of the assumptions underlying this approach , and given low-detection of some species at times (Table 6, Figures 3, 4, 5, 6, 7, 8, 9, 10, 11), we violated this assumption in some cases . However, repeated measures ANOVA is very robust to deviations from normality, with non-normal distributions seldom affecting the overall outcomes or interpretations -. Severe deviation from normality can lead to lower p values, or an increased probability of type I errors or false positives. For our study, this simply means that some of the few reported differences in overall mean prey PTI between baited and unbaited areas (Tables 2 and 3) may not be real . This first step determines crude differences in prey PTI between treatments but cannot identify causal factors for any observed differences. In Step 2, we determined short-term changes in prey PTI values between pre- and post-baiting surveys by assessing mean net changes in PTI (i.e. changes in the baited area after accounting for changes in the unbaited area) with one-factor repeated measures analyses, or t-tests. To ensure maximum analytical power, this was done for each site where at least four pre- and post-baiting surveys were conducted. This step identifies any short-term responses to baiting and their cause (i.e. baiting) but cannot determine whether or not these observed responses are sustained over longer timeframes. Greater detail on the resilience of dingoes to lethal control and the factors affecting the efficacy of individual baiting programs can be found elsewhere in ,,. In Step 3, we assessed (1) temporal correlations between predator and prey abundance trends in baited and unbaited areas and (2) whether or not the difference in species’ PTI values between baited and unbaited areas increased, decreased or did not change over time. This third and final step assesses whether or not population trends in baited and unbaited areas fluctuate synchronously, identifies causal factors (i.e. baiting), and determines whether or not predator or prey population trends in baited and unbaited areas are diverging or converging over longer timeframes. Step 3 is the most conclusive of our analyses for determining the responses of predators and prey to baiting. This three-step analytical approach was designed to assess the outcomes of baiting at each site for each species, and was not designed to assess the relative influence of the many other factors that might also influence predator and prey population dynamics, such as rainfall and those others mentioned above (e.g. ,). Analyses were performed using all available data. However, data were not available for all prey species at all sites because the distribution of various species does not extend to all sites  or because extant species were not detected on tracking plots or recorded (Table 6). For example, though they were present at some sites, no analyses could be performed on koalas (Phascolarctos cinereus) due to insufficient data (Table 6). Additional details on the sensitivity and reliability of our methods can be found in Allen et al. , or Allen , and Allen . (A) Prey PTI trends are negatively correlated over time between treatments and/or (B) divergence or convergence of PTI trends is apparent (potentially indicative of longer-term dingo control-induced prey declines). All PTI values obtained during our study are presented in the tables and figures. LA designed and supervised the study. BA and LA collected field data and performed preliminary analyses. BA performed the remaining analyses, constructed the tables and figures and wrote the majority of the manuscript. RE performed statistical analyses. LA, RE and LL contributed further to the writing of the manuscript. All authors read and approved the final manuscript. Generous in-kind support and hospitality was freely provided by the owners and managers of the beef-cattle properties on which we worked - this research would not have been possible without them. Damien Byrne, Heather Miller, James Speed, Steve Eldridge and Tony Gonzales assisted in the collection of field data. Analytical and editorial advice on earlier drafts of the paper was provided by Joe Scanlan, Matt Gentle and Matt Hayward. Allan Lisle provided additional statistical advice. Al Glen, Camilla Myers, Dane Panetta, Glen Saunders, Greg Campbell, Jim Hone, John Read, Peter Bird, Peter Fleming, Simon Humphrys and Tony Pople provided advice on the associated study of Allen et al. , which advice was further used to shape aspects of this related paper as well. Generous funding for components of this study was provided by the following Australian Government funding sources: Bureau of Resource Sciences, Caring for Our Country, and Natural Heritage Trust. These funding bodies had no role in the design, implementation, analysis or publication of this study. Some of this funding was administered by the South Australian Arid Lands Natural Resources Management Board. The production of this report was undertaken as part of work supported by the Invasive Animals Cooperative Research Centre.